Easy Creamy Primavera - Wholly Delish! It’s Spring! Finally the weather is turning and, with the newest member of our family a full seven weeks, we’ve emerged from our lying in of sorts to greet the outdoors. This explains why for the past little while I could easily have eaten this Creamy Primavera ‘spring pasta’ multiple times per week. 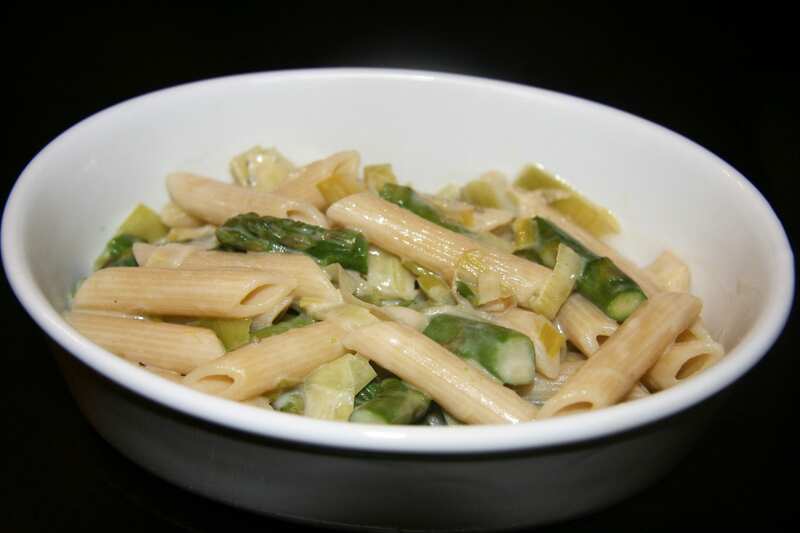 I keep it fresh by switching up the pasta and the vegetables, but this very simple version with leeks and lovely fresh green asparagus takes the cake as far as I’m concerned. This Creamy Primavera satisfies my lifelong craving for Alfredo, but is a lighter version thanks to just one cup of 5% cream and substituting vegetable stock for the rest of the sauce. The ‘easy’ in the Easy Creamy Primavera is a simple trick to save on pot dishes and save on effort – instead of making bechemel and then separately cooking the vegetable, I sauté the vegetables, add a heaping tablespoon of flour and then add the liquids to the same pan. The sauce thickens just enough and the Parmesan added at the end really brings it together. Depending on my mood I sometimes add a splash of Frank’s Red Hot on top – a habit I picked up from my husband which used to drive me crazy when I was first cooking for him 🙂 But I assure you, it’s perfectly delicious as is! Fill a large pot with water and add salt. Bring to a boil and add pasta. Cool until al dente or desire tenderness. In the meantime, add leeks (or onion) and oil to a large pan. Sauté on medium until leeks are softened and just starting to brown. Add garlic and asparagus and continue to cook until garlic is aromatic and asparagus is cooked and bright green in colour. Add flour and stir to coat vegetables. Add stock and cream, turn up heat to medium high and cook stirring constantly until sauce begins to thicken. Remove from heat and mix in the parmesan cheese. Drain and toss pasta with the vegetables and sauce until well coated.